This is a post about salads and some alternatives to the ol’ lettuce and tomato in a bowl routine. I could have had any number of names for this post, depending on what attitude I wanted to express: “You did WHAT to your salad?” or how about “Press This!” (inside WordPress blogger pun). Let’s see how the post turns out and then I’ll name the blog, okay? Spring has officially arrived and my menus have gotten much lighter. I am definitely craving a salad but I’m not too excited about a regular Salad 101 creation. The answer? Boiled salad! Before you get too many images of a sorry piece of lettuce cooking away in a pot of water, let me explain. A boiled salad is a combination of very lightly boiled vegetables that are served cool and often with a salad dressing. I like to make my boiled salads as colorful as possible and I like to use decorative cutting. I usually choose either three or five ingredients for the salad. 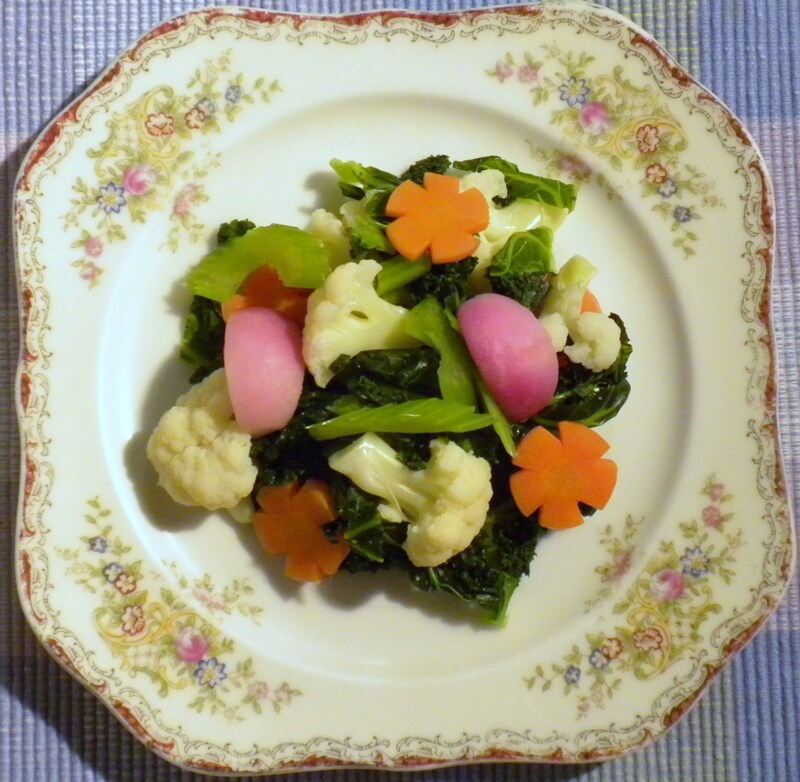 Here is an example of a boiled salad: cauliflower florets, kale, carrot flowers (more about that in a minute*), radish wedges and celery. That’s five. Each veggie is cut into smallish bite-size pieces and boiled. To do that, bring spring water to a boil with a good pinch of sea salt. Get your veggies cut up. 1. Start by boiling the cauliflower. What you want to do is boil the light-colored vegetables first so they aren’t dulled by the greenish or orange-ish cooking water from boiling the other vegetables and so they aren’t influenced too much by a strong-flavor such as onions if you had that in your salad. For this combination here, I would boil the cauliflower, then the celery, then radish then carrots then kale. 2. Do not over boil the vegetables. Just drop them in the water and cook them a little bit–less than if you were serving them hot boiled or steamed. They will appear brighter than when they were raw and at that point, pull them out of the boiling water. You want most of them to still have some crunch but that “raw quality” is slightly altered by boiling. Your dark leafy greens can be a bit more cooked because while you definitely want them to be a bright green, you still want to be able to chew them! 3. When you take the vegetable out of the boiling water, put it in a colander to drain. If you think you overcooked it, you can run cold water over it to stop the cooking but I don’t like to do that because it reduces some of the flavor. 4. When everything is boiled and drained, place the veggies in a serving bowl or platter. You can serve your boiled salad at room temperature or slightly chilled with a dressing of your choice. 5. Save that cooking water! You now have a flavorful soup base. This is a cooking tool called a “salad press” or “pickle press.” A pressed salad is not cooked at all, yet it is not just like a raw salad because it has been processed by pressing it in some sea salt for a period of time. This is actually a pickling method, only it is done for a very short time to make an ever-so-lightly pickled or pressed dish. To press salad, you can choose things like lettuce, cabbage, carrots, cucumbers, radishes or anything that can be cut very small or that is “press-able.” Chunks of cauliflower or broccoli, for instance, are not very press-able. Use them for boiled salads. Again, I like to use three to five ingredients for a pressed salad. Here’s a simple pressed salad using cabbage, carrots, cucumbers, red onion and parsley. 1. Cut the cabbage into thin bite-size strips. Cut the carrots into thin matchsticks. Cut the cucumbers in half. Remove the seeds with a spoon if you wish. I don’t remove seeds because I like my foods to be “whole.” I also don’t peel my cucumbers because I buy organic and use the skins of my veggies. Cut the half-cucumbers into slices. Cut the red onion into thin slices. Cut the parsley into small pieces. 2. 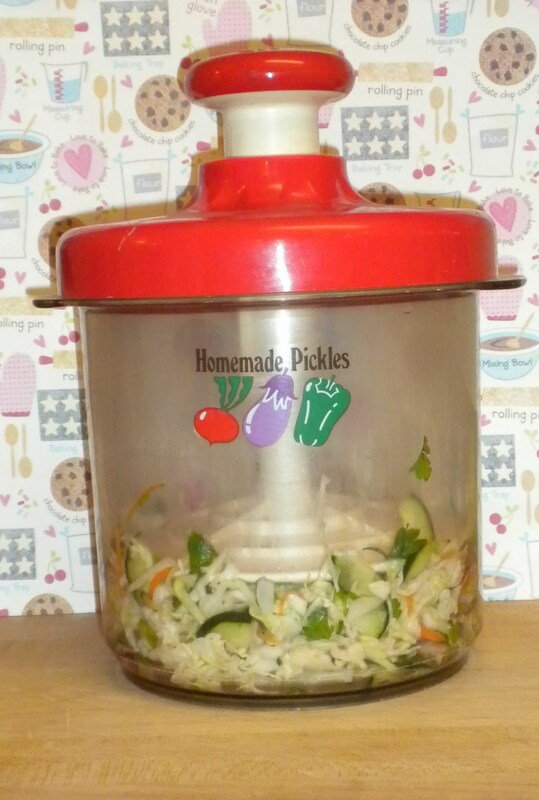 Put all the cut veggies into the salad press. Add sea salt and start mixing the salad around with a utensil, chopsticks or–I just use my hands. You will add enough sea salt to make the veggies start sweating or glistening. The salt is pulling some of the water out of the vegetables. Don’t worry, you’ll rinse the excess salt out later. 3. Tighten the press down so the veggies are snug and the pressure of the press is helping to get the water out. If you don’t have a salad press, just use a flat plate and a weight such as a heavy jar or a brick or rock. They will do the same thing. 4. The time you will press the veggies will depend on what veggies you use. If you press a lettuce salad, it will only take 20-30 minutes and lettuce needs very little salt to “process” in the press. With cabbage it will take longer–an hour or more. You can decide how “pressed” you want your salad to be by how you like the taste and texture. The thinner you cut your veggies, the less time they will take to press. 5. When the salad is done pressing, you will see excess water in the press and you should drain that off. Then rinse the salad itself in cool water and gently squeeze out the excess water by hand before serving. You can serve the pressed salad with a dressing or not. I usually don’t feel it needs one. These two methods will help you lighten up your menus for spring and summer! If you try them, let me know how they turned out for you. I welcome your feedback and your questions. For additional free recipes, cooking tips, and food information, you are invited to join PATTY’S CLUB! Just go to my new Patty’s Club Page https://mycookinglife.com/pattys-club/ and follow the directions. This entry was posted in Cooking, Food, Recipes and tagged Boiling, cabbage, Carrot, Cucumber, Japanese pickle press, salad, spring menu, Vegetable by mycookinglifebypatty. Bookmark the permalink. I notice you say you use Spring water to boil the vegetables. How do you store your water for year-round cooking? Right now, Nick, I have to buy spring water and usually get it in 2 1/2 gallon jugs. I try to keep it in a cool spot and it gets used up pretty fast. My best suggestion though is to invest in a good water filter. OK, Patty, you’ve got to tell me. Do you eat totally macrobiotic? (Don’t know if I’ve asked you this question before, but may ask again.) I have made boiled salad! 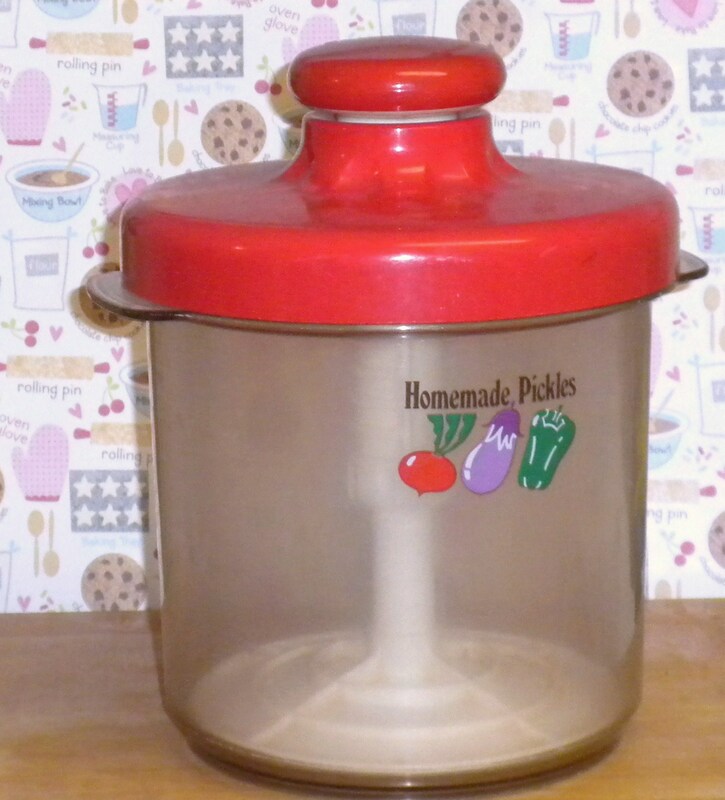 And have tried to press salads with a heavy plate, but this never worked well. Congrats on the hits! Hope you saw my response to your comment. YOU ROCK, Cooking Girlfriend! Hi Kathy! The heavy plate idea has to have a really heavy weight on it and enough salt in the salad to get the water out (then you have to rinse well!) Some might say I’m not totally macrobiotic but I use the principles every day for balance and I eat a LOT of what is recognized as “macrobiotic” foods. Thanks for bringing your sweet self over here! Thank You! I always go for something colorful.